The sport of canicross is rapidly growing in the UK as more people discover it and the benefits it can bring for both human and canine alike. Canicross in it's simplest form is running cross country (on trails and paths, rather than roads) with your dog and many people have been doing this with their dogs without even realising there is a name for it, or that it is a sport which has it's own competitions. 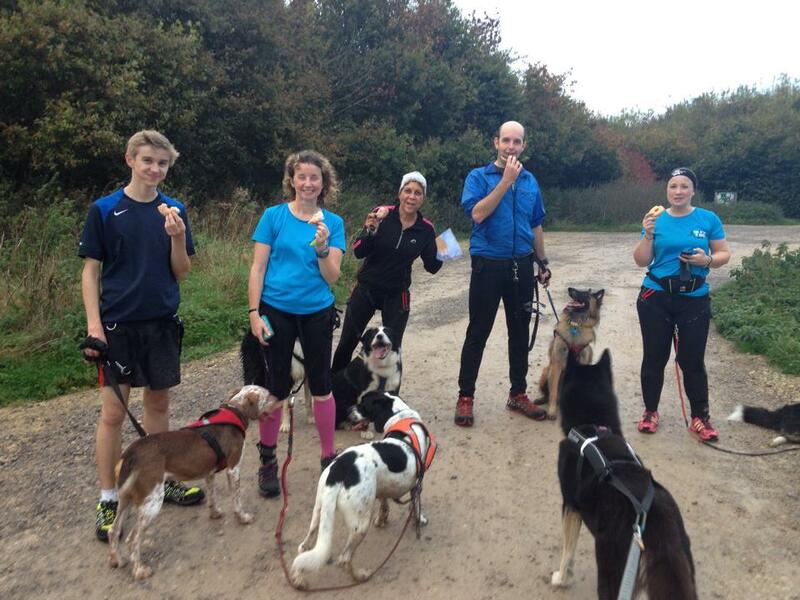 Behaviour - Many rescued and high energy dogs have benefitted from participating in outdoor pursuits with their owners such as running (canicross) biking (bikejor) and scootering in addition to the more established outdoor dog activities. The effect of activity is to allow your dog an outlet for energy which might otherwise be used for destructive and unwanted behaviours around the home & garden. Canicross is a great way to exercise a dog who can't otherwise be let off lead due to (among other things) a high hunting instinct, which is why you will see many different breeds participating from terriers to malamutes. Health - Recent studies estimate that as many as one third of dogs nationwide are overweight and this figure is set to rise to over half of all dogs by 2022. Obesity is linked with diabetes, orthopaedic disease, heart disease, respiratory distress, high blood pressure, skin diseases & cancer (much the same as in people) so you might even be prolonging your own life as well as your dogs’ with consistent exercise! 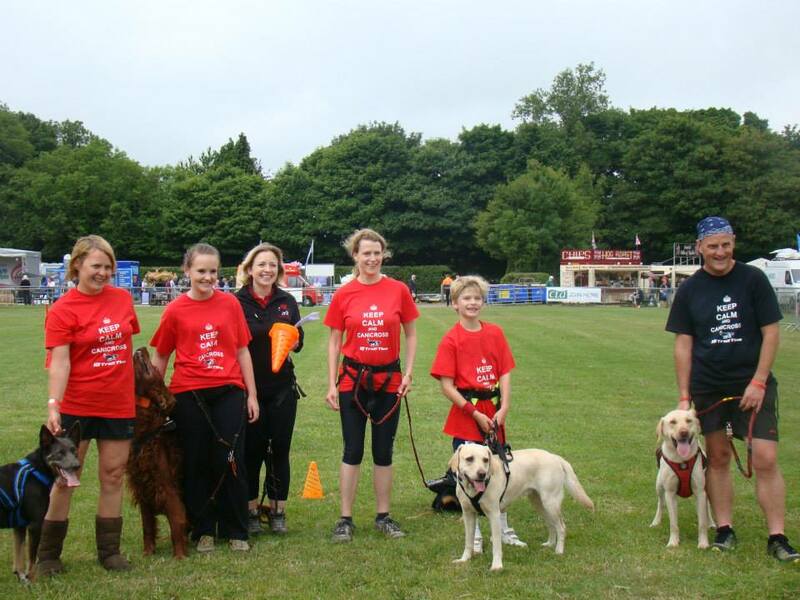 Fun - Taking part in dog sports usually means you and your dog get to socialise with likeminded people but even if it’s just you and your dog, you will be strengthening your bond with your dog which is very rewarding and great fun too. What do I need to canicross? 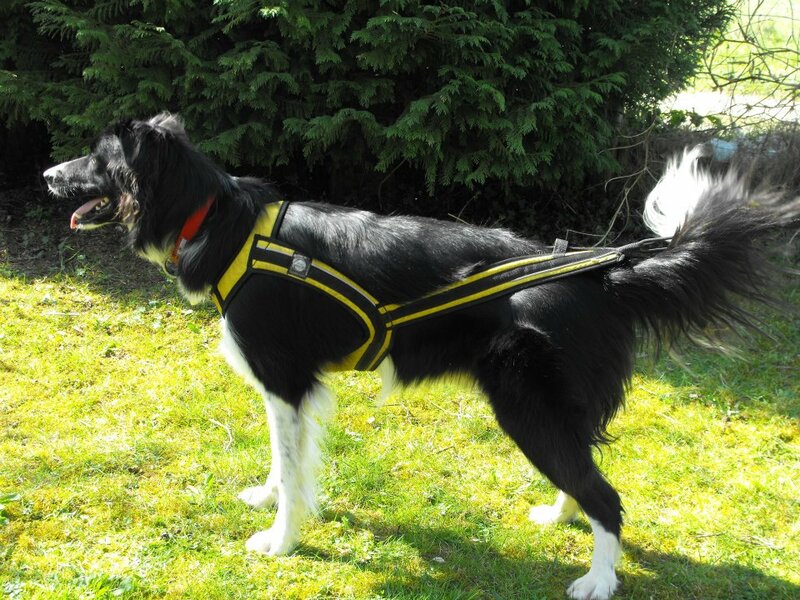 The basic kit for canicrossing properly is a comfortable, well fitting harness for your dog, a bungee line to absorb the shock from any pull for both you and your dog and a waist belt so you are hands free when running. These 3 main elements form the basis for a pleasant experience when running with your dog. 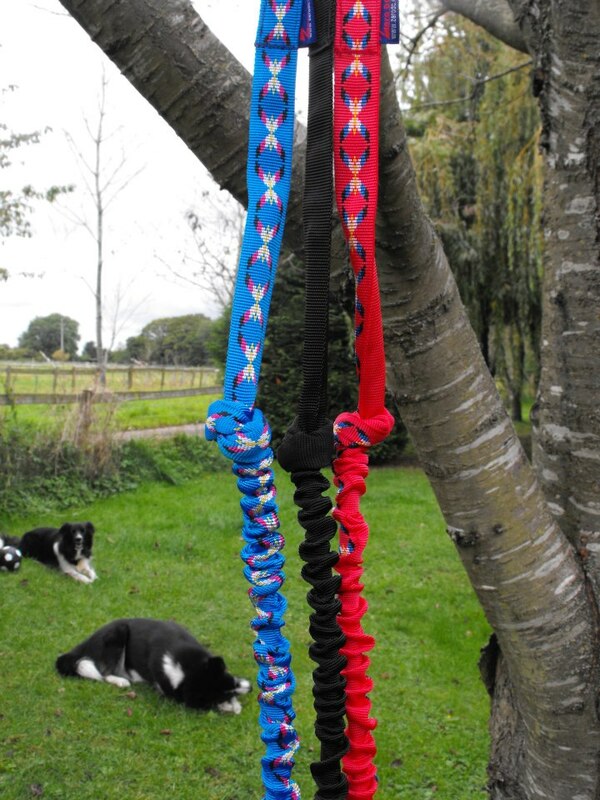 Without the harness you risk pulling on your dog's neck, without the bungee you can find yourself jerked after something interesting on your route and without the waist belt your may find your neck, shoulders and back ache from holding a lead. What line? As long as there is bungee for shock absorption then most lines will be fine. Some are made from webbing and some from stronger polypro braid but which you choose is personal preference. 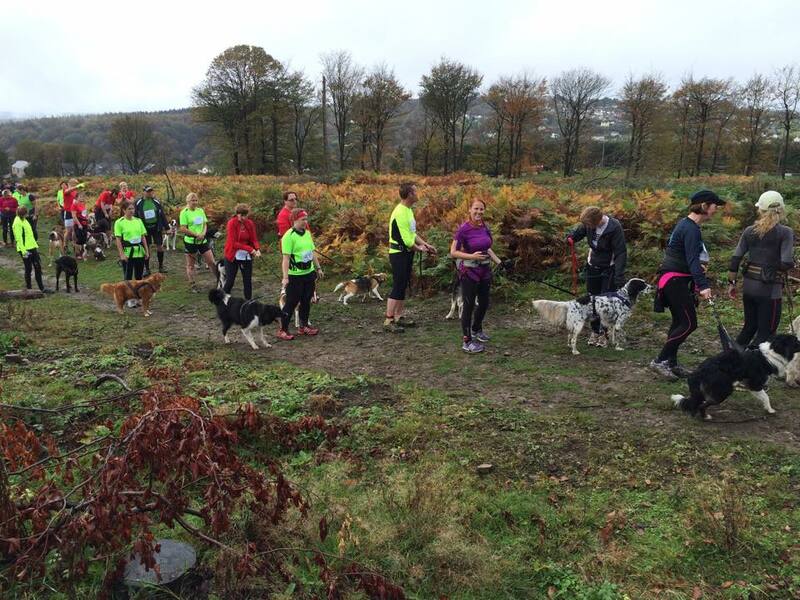 The standard canicross lines are approximately 2 metres when stretched but many people run with shorter or longer lines based on their own requirements. Some races have rules on line length so do ask if you're thinking of competing in canicross competitions and we can inform you of the rules. What waistbelt? The style of waist belt which you choose is down to what you would like from it and what you find most comfortable. 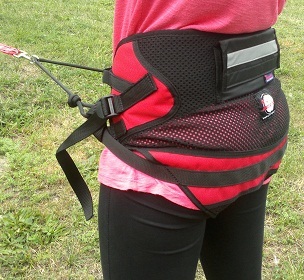 I've written about choosing a belt here: http://k9trailtime.wordpress.com/2013/05/21/belt-braces-how-to-choose-a-canicross-belt/ but the basic things you need to ask yourself are: Do I want something padded or lightweight? Do I want leg straps? Do I want pockets? Once you know the answer to these then it makes choosing a belt much easier. The purpose of the belt is for your comfort and to ensure canicrossing with your dog does not damage your back, shoulders, neck or arms. How do I get started? The best way to get started is to find a group of people locally who are already canicrossing, as there are many social groups now encouraging new people to join them. A group will most likely have spare kit they could loan you to kit to try out and will be able to offer advice about training your dog with voice commands for directions etc. Lastly, but most importantly, your dog needs to be fit and fully developed before you begin canicrossing. Most races will not allow a dog under 1 year old to compete and it is recommended you start your dog off very gently at around the year old stage and not before. You also have to ensure you will be putting your dog's health first and to avoid any problems, stick to running in cool temperatures (never in the heat of the day in summer) and carrying water with you in case your dog needs it.